I thought I'd put up a copy of the reading I had from the Introduction to the Devout Life by St Francis de Sales. I also had a Gospel reading (Matthew 16:24-27). "She must offer God her body and chastity by means of a vow. After making her vow she no longer has the power to give up chastity without giving up her title to heaven. Hence she will watch over her vow so jealously that not for a single moment will she let the least thought of marriage enter her heart. In this way her holy vow will serve as a strong barrier between her soul and every project contrary to her resolution. "A vow not only makes good works done as a result of it more acceptable to God but it also encourages us to put them into practice. It gives God not only the good works that are the fruits of our good will but likewise dedicates to him the will itself, the tree on which all our actions grow. "By simple chastity we lend our body to God while still retaining the liberty to use it for sensual pleasure at some other time. By the vow of chastity we make him an absolute and irrevocable gift of our body without reserving to ourselves any power of recall. In this way we happily make ourselves slaves of him whose service is better than all royal power. "Souls who are so happy as to desire to follow this advice should do so prudently, devoutly and firmly, having first examined their resolutions, invoked God’s divine inspiration, and taken counsel of a wise and devout director. Moreover, this renunciation must be made purely and simply with the single intention of turning all the affection of one’s soul toward God and uniting one’s heart wholly with that of his Divine Majesty. "In God’s eyes nothing can truly merit praise except what is done for his sake." I had a lovely day today. It started with a card in the post and a few text messages conveying best wishes. And there was one text which was from a friend who had managed to get lost when leaving Sidcup Station. There was a card in the sacristy for me (which had been sent c/o the PP) with best wishes from fellow-blogger Paulinus (of In Hoc Signo Vinces fame) - this made me laugh out loud, because the picture on the front of the card was thought to be one "Blackadder"... the first Archbishop of Glasgow, that is, not the character played by Rowan Atkinson! I hadn't realised that there really was someone of that name!! The morning progressed as I indicated in my last post: Mass, Exposition, Benediction and then the Servers' Latin lesson (it was to learn the Classical Rite, not the Novus Ordo as I thought) and then it was time for me to renew my vows. It took much less time than the half-hour I had predicted... partly due to the fact that this year, instead of a homily, Fr Tim read an extract I'd picked from St. Francis de Sales' Introduction to the Devout Life. It could have been written especially for me, and I liked it so much I've had the same reading for a couple of years. Then we went to the Large Hall, where the UCM had really gone to town preparing a beautiful spread. Just for once I allowed myself a few drinks (I'll have to pick the car up tomorrow) and had a relaxing afternoon chatting away to my friends. The blueberry pound cake baked by Ma Beck made its appearance, and was a great success - its demise was duly photographed by Fr Tim - the evidence will appear either on his blog or mine (if he sends me copies of the photos!) It really was delicious. To finish off my day, I got a comment from those great guys at Orthfully Catholic: they've sent me a spiritual bouquet of prayers from all of them - Masses, Rosaries and Holy Hours - and that was a wonderfully uplifting thought. The knowledge that people are praying for you is just awesome. Because I want to fit in with the usual Saturday devotions in the Parish, I will be in church pretty much all morning. There will be Mass (Novus Ordo, but in Latin and ad orientem at the Lady Altar) then Exposition for an hour, and Benediction. Then Fr Tim will be teaching a couple of youngsters some Latin so that they can serve Mass (Classical Rite eventually, but Novus Ordo to start with) and I help to fulfil the child protection requirements by being there... as well as getting to learn some Latin, hopefully! And then my Renewal of Vows is at 1pm. And of course, I haven't neglected the more secular side of things: the UCM will have the catering well in hand, and tomorrow the bar will be open in the Parish Club. I've got my outfit sorted, and I've treated myself to a DIY facial. 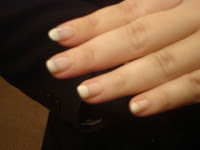 I am also attempting to do my nails... they've all reached a decent length for once, and I decided to go for the "French Manicure" look. Easier said than done - painting all the tips white on my left hand was ok, but getting the edges straight on my right hand is proving more problematic. Vanity, vanity... well, yes, maybe so, but a girl has got to try and look her best on her "wedding anniversary" !! And to counteract the very secular nature of my activities I am listening to a CD of Mass chants - Missa de Angelis to be precise. ...none of the people from the emergency services (police, ambulance and fire brigade) could believe that I'd survived the crash, and with nothing more than bad bruising and a tiny cut on one finger from a fragment of glass. The insurance assessor bluntly told me that he'd double-checked with the company when he'd seen the state of the car, because he was sure that the driver would be "out of the picture" and he needed to know who to speak to. At least that won't be happening this year... unless he's planned another trip for tomorrow! ...unfortunately I don't know how to put up a longer version of a post somewhere else, so the whole thing will be posted here. I was attracted to St. Anne Line as a patron because of her feisty retort at her trial when charged with harbouring a priest, where, totally unrepentant, she declared that her only regret was not harbouring a thousand of them. However, I had been unable to find out very much else about St Anne, and even hours of surfing the web had only resulted in three very sketchy accounts. I was talking to Joanna, about the lack of information available, and it was then that one of those spooky coincidences occurred. She told me that she had recently met a priest at Tyburn Convent, and he was the Parish Priest of a church dedicated to Saint Anne Line. We both agreed that this was amazing, and agreed to make a pilgrimage to the church to see if we could find out more. The day we picked for the pilgrimage was a Saturday. We both wanted to get to Mass, but although the idea of attending Mass at the church dedicated to St Anne was an attractive one, the idea of getting up early enough to find it was somewhat less so. Instead, I drove over to Joanna’s parish to meet her, and we attended Mass there. Then, very excited, we jumped into the car, and tried to work out the best route. This was when we hit our first snag. Neither of us knew the address of the church. We decided that we might try to locate it by looking through the Catholic Directory. The first one we came across was in Dunmow, which made sense because this was where St Anne was born. We looked at the name of the parish priest, and this wasn’t the priest Joanna had met at Tyburn. Eventually we found the one she was looking for, in South Woodford. This lead to the second snag: which one should we visit? We decided to look at distances, and consulted our map. Third snag: Dunmow wasn’t listed in the map index. We then rang the number listed in the directory, and I spoke to an elderly man (presumably the Parish Priest) to ask for directions. After a few acidic comments about the poor quality of our map, he told us the name of a nearby town. Then I realised that Dunmow was on the map…. but it was listed as Great Dunmow in the index. Silly me! We still were torn between the two places: the church in Dunmow was named for Our Lady and St. Anne Line, and was the older of the two churches, as well as being in the town where she was born; the church in South Woodford was dedicated to St. Anne Line alone, and was the parish of the priest Joanna had met at Tyburn. Intrepid explorers that we were, we hit on a compromise... and decided to visit both. The journey itself was very enjoyable, with both of us chatting merrily away. In fact, we were chatting so much that we missed the turn-off for the M25 (only coming to our senses when we passed Guildford) and later took a wrong-turning onto the M11 (we suspected that we were going the wrong way when Joanna spotted Canary Wharf dead ahead!) But the weather was gorgeous, traffic, for once, was minimal, and we hardly noticed the time. Before long, we had arrived in Dunmow. We found a car park in the centre of the town, and checked out the map for the location of the Catholic Church. It was only a few streets away, and so we strolled off to find it. It didn’t take us long, but it didn’t look much like a church from the outside. Both of us gazed at it in horror, but we decided to go and have a look inside. The church itself was locked, but as we stood there considering our next move, a woman appeared at a side door. She explained that the church was normally locked during the day, but that she was cleaning in preparation for the Sunday services, and we were welcome to have a look inside. 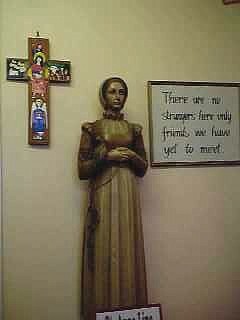 We followed her through a community hall and stepped into the church. The contrast with the dismal exterior was so great we were almost speechless. The walls were faced with beautiful wood panelling and there were some really lovely paintings on the walls, including a huge one of St Anne Line, probably painted around the time of her beatification. We started to chat to the lady who had let us in, and she told us a bit about the parish and how it had developed over the years. She also brought us several large pieces of card which had information about St. Anne pasted to them. I asked if she had access to a photocopier, and she explained that there were several places in the High Street that did photocopies, and we were welcome to borrow the information until we could get it copied. Having looked around for a bit longer, we lit a couple of candles and said a prayer or two. We then went in search of a photocopier and lunch, in that order. We found a bar with a garden, and sat outside enjoying good food and good conversation. We were tempted to linger over coffees, but it was getting late, and we still had another church to find. Reluctantly, we bade farewell to Dunmow, amazed at the contrast between the outside and the inside of the church, delighted with the information gleaned about St. Anne and marvelling at our luck at finding the lady in the church. The journey to South Woodford was even easier than the one to Dunmow, and with fewer unintentional detours. We located the church easily, but again were appalled at its appearance: it looked like some sort of concrete bunker. The church was closed, and we wandered across to the presbytery which was nearby. The parish priest welcomed us, and invited us in for a cup of tea. He was just back from an Ordination, and would shortly have to go in to hear Confessions, but he said he would be delighted to show us the statue of St. Anne. This, he explained apologetically, was actually being stored in his garage, because it had been vandalised. He was hoping to set it up inside the church, but hadn’t yet prepared a suitable spot. The inside of the church was again in complete contrast to the exterior. A passage about St Anne from the Martyrology was framed on the wall, but it was in Latin. I copied down a Latin inscription from a stone in the wall, hoping to get my own Parish Priest to translate it for me later. We stayed for a while to say another prayer, and then started off for home, praying the Rosary together in the car. I felt sure that St. Anne was watching over our little pilgrimage, and was helping us along. I felt it very strongly when we met the lady cleaning the church in Dunmow, quietly preparing everything for the celebration of Mass, much as St. Anne herself must have done. And I felt it again when we turned up at just the right time to meet the Parish Priest in South Woodford. I used to think of pilgrimages as long journeys to big shrines in foreign countries, but every time we make a special journey to a church or other place associated with a saint it is a pilgrimage of faith. I hope and pray that I will be able to make many more. I was glancing through The Secret of the Rosary by St. Louis-Marie Grignion de Montfort this evening, and as sometimes happens, a paragraph sort of "jumped out" at me. "Take great care to avoid the two pitfalls that most people fall into during the Rosary. The first is the danger of not asking for any graces at all, so that if some good people were asked their Rosary intention they would not know what to say." "So, whenever you say your Rosary, be sure to ask for some special grace or virtue, or strength to overcome some sin." I'm getting excited... there is now less than a week until I renew my vows. I've said it before: I know I do not need to renew them - as far as I am concerned, I have chosen my path in life, and that is that. But it helps to remind myself (and my friends) of why I have made this choice, and what it involves. Having to print out the order of service also helps to focus the mind somewhat! 1) to live a life of prayer and self-denial, following Christ’s teaching that "anyone who wishes to be a follower of mine must take up his cross and follow me;"
3) to live in obedience to the teaching and authority of Christ and his Church so as to accord with the will of Christ who was himself obedient even unto death on the cross. I was discussing things with the Vicar General of the Diocese at the beginning of the year, and he asked me which vow I found to be most difficult to keep. It may come as a surprise to many people that the vows of chastity and obedience are actually reasonably straightforward to live out in everyday life. Prayer and self-denial are far more difficult. But more on that some other time.